A government, nation, or an individual for that matter, who pours their own definition into terms or words is doomed to failure, confusion and isolation in a world where communication is imperative for success on any level. A person cannot say “I have no enemy” and walk peacefully down a path lined with a mob who seeks his death, expecting a leisurely stroll. The Jews learned long ago, when someone says they’re going to kill you, believe them. Likewise, a government cannot long ignore an enemy who has declared war upon that nation, no matter how distant that enemy may seem. A nation, government, or individual who refuses to recognize an existential threat is either naive, insane, or suicidal. However, this is exactly what the United States Government has been doing for over ten years. Even as far back as 9/11/2001, US government officials and their willing accomplices in the media, have gone out of their way to refuse mention of the enemy that struck us on that fateful day. Even after 13 years of war operations, in Afghanistan the US has lost 2344 military personnel, and 4486 in Iraq to an undefined enemy. Many of these casualties were the result of “Rules of Engagement” (ROE) which tie the hands of our brave American service members, and resulted in the single largest loss of Special Operations Forces in American military history, the shoot down of Extortion 17, August 6th, 2011, in the Tangi Valley. 30 crew and Spec Ops personnel were on board including 17 Navy SEALS. The father of one of those men, Billy Vaughn wrote “Betrayed”, an expose’ on how faulty ROE’s (which includes all missions approved by Afghan military commanders), among other bad decisions resulted in the tragedy that cost his son Aaron’s team their lives. I highly recommend this book. We continue to fail to recognize the true enemy; the ideology that not only threatens America, but the rest of Western Civilization. This ideology is diametrically opposed to the values and freedoms that Americans hold dear. It is incompatible with our United States Constitution, nevertheless our government continues to embrace this ideology, yes, even promote it within our own borders. -President George W. Bush coined that phrase and was reprimanded by followers of this enemy ideology for referring to our military combat operations going into Afghanistan as “this crusade, this war on terror, is going to take a while.” in an unscripted statement 5 days after 9-11. 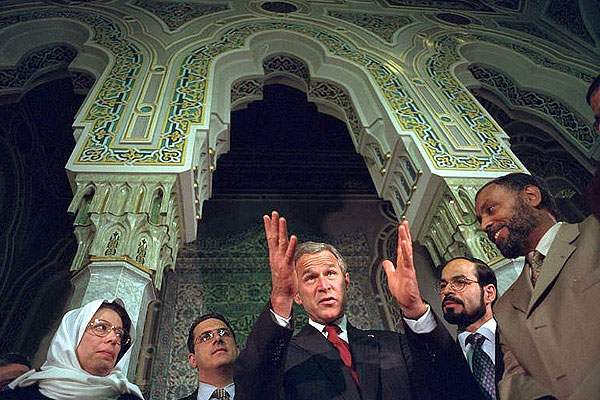 The Council on American-Islamic Relations did not like that word “crusade”, and Mr. Bush apologized and never used it again. He also became an apologist for Islam, referring to it as “a peaceful religion” the very next day at the Islamic Center of Washington DC, while CAIR co-founder Nihad Awad looked over the left shoulder of the President. Yes, I will say it. Islam is the enemy of America, Israel, and the entire Western Society as well as all the world! I am sick to death of everyone from the media, to government officials, to pulpits in America avoiding this controversial statement. Islam has declared war upon all nations, tribes, cultures and governments that do not submit to Islamic leadership and government. This war was declared in the 7th Century as the Islamic hoards swept across Northern Africa up into Spain, and conquering Persia, India, and Afghanistan pressing up into Eastern Europe. It has never been ended. As you can see in my previous post, the video of the History of Jihad, Islam has been on the offensive pretty much non-stop since Muhammad conquered Mecca in 630 AD. In fact, just about every month or two now, we hear of a new jihad group declaring war on Israel and America. Islam is the arch-enemy of Judaism and Christianity. It is the enemy of paganism, atheism, and Zoroastrianism (think Yezidi people trapped on the mountain). It has conquered, murdered, subjugated, and oppressed people of all other cultures and religions for 14 Centuries. It is relentless, it is cunning. Islam is persistent. Islam is unforgiving. Islam is patient…very patient. But listen, Islam is not “Terror”, as in “the war on terror”. To say “War on Terror” is like saying “War on Blitzkrieg”. Blitzkrieg (blitz) was a tactic employed by the Nazi’s as they rolled through Europe, speedily conquering neighboring states. To declare “war on Terror” would be like Eisenhower deciding to fight only those Nazi forces who are using blitzkrieg to gain control of its victims. Or perhaps deciding that the Allies would only kill the SS troopers and avoid fighting the regular Wehrmacht, after all they were mostly draftees, and didn’t really have a choice in their situation. Utter foolishness! Does anyone remember Dresden, Berlin, Hamburg? But wars were simpler then. The enemy was anyone who aided and abetted, or participated in, the war fighting or subversive capabilities of those who engaged in activities with malice towards the United States of America and/or threatened the safety/security of American citizens and/or our allies. It is a tactic used by an enemy to render its opposition “terrified” and confused, disorganized and willing to “submit” (the very definition of “Islam”) to be ruled by Islam. Islam has learned that Western secular government officials and media drones don’t seriously hold any religious values, beliefs or practices. They understand that Europe and America have been “de-educating” their children for about 3 generations now, replacing the Judeo-Christian ethos with “Pluralism” and “Multiculturalism”. (Pluralism= All beliefs, faiths, ideologies are of equal value; Multiculturalism= No culture is superior and diversity is the modern goal for perfect cultural balance) Of course, Islam is correct in its assessment of the state of Western Culture. We have set ourselves up to be conquered. We are so willing to embrace an ideology/religion that is totally foreign to the American ideal, and so quick to refuse the true roots of everything that made America the strongest, most benevolent, peace-loving country in world history, our Judeo/Christian heritage. Our government has been influenced in the highest offices by Islamic groups such as CAIR (HAMAS’s American PR organization), Muslim American Society, Muslim Public Affairs Council, Islamic Circle of North America, Islamic Society of America, and the list goes on. These groups are all known Muslim Brotherhood affiliates. The Muslim Brotherhood has been classified as a terrorist organization by Egypt, Israel, and Saudi Arabia. If you haven’t read the “Explanatory Memorandum” that outlines how the Brotherhood plans to take the United States from within, please, by all means click here to read it! (The English translation begins halfway through the document) The Muslim Brotherhood also is known for its desire to re-establish the Caliphate, or “Khilafah”, the Islamic State. This is a common objective among Muslim organizations world wide, not just those “jihad” “terrorist” organizations like ISIS, Al Qaeda, Taliban, Boko Haram, Al Shabaab, Haqqani, Al Nusra, Islamic Jihad, Abu Sayyaf, PLO, HAMAS, Hezbollah, etc, etc, ad nauseam. Do you get the picture? For every Muslim apologist in the West who says that Islam is a peaceful religion there are many more who either actively engage in jihad, support it financially (this is where a portion of zaqat alms goes), or know that jihad is a legitimate tenet of Islam and to deny it’s purpose of “warring against non-Muslims…to establish the religion”** of Islam, is to deny Islam itself!! (**Umdat al Salik, Classic Manual of Islamic Sacred Law [Sharia], o9.0, p. 599). The Caliphate is that “Islamic State” that I wrote about in 2011 under the title “New Khilafah”. You can visit that article to get a bit of history about the Caliphate and why it is important to Muslims. So you see, ISIS, now known as “Islamic State” has simply put feet to the movement to establish the Caliphate, which has been the goal of Islam since the beginning, and was temporarily suspended right after WW1. ISIS is only one of a myriad of groups, here-to-fore listed, which all hold the same ideology: Islam must rule the world. Now where do you suppose all these freak extremist terrorist groups get their ideology? Well, from the same place that those “peaceful” Islamic supremicist and friendly civic/social groups (CAIR, MPAC, MSA, MAS, ICNA, ISNA, etc.) get theirs… Al Quran (Koran)!! Every one of these groups is made in Islam! Check out this Clarion Project article on Mohamed Elibiary, a Muslim Brotherhood supporter who was appointed to the Dept of Homeland Security Advisory Board by the Obama Administration. Elibiary tweeted that “The Caliphate is inevitable” and touted it as an EU version of an Islamic Union of States. President Obama and the rest of the stooges may continue to swear that ISIS is an “extremist group” that “does not represent any religion” or speak for any faith, and are not properly following Islamic teachings. Well, both the jihadis and the silent Muslims all around the world disagree with you, sir. These are undeniable doctrines inherent in the Islamic religion/ideology. They are indisputable in their fundamental influence in the entire religion of Islam. Now, I would not say that every Muslim wants ISIS to rule the world, nor would I say that every Muslim is an “Islamist” (one who seeks to propagate the religion by whatever means, peaceful or otherwise. A Muslim who is not an Islamist is in danger of apostacy by the standards of Koran and the Sharia). But every “Islamist” does want Islam to rule the world. And while not every Islamist is a violent Jihadi terrorist, they do share the common objective of Khalifah. And those organizations I listed earlier in this article, both the Jihadi groups and the political/social groups all share that common objective, just as indicated by the Elibiary quote. “The War on Terror” cannot be won. One could just as well declare “war on child abuse” or “war on poverty” (oh, wait, we tried that one-failed), or “war on drugs” (another failed). As long as evil exists in the heart of Man, man will continue to succomb to evil. It is his natural state. Only Jesus Christ can change the heart of man. “Brother Rachid” is a former Muslim from Morocco who had his heart changed by Christ. He has a message for President Barak Hussein Obama. Please watch. I’m late reading your posting, as I was in Israel, exploring the land. This president (I hate to say “our’) is allowed to lie again and again according to Islam to hide what they are doing. Sad thing is, people believe him, rather than millions of facts exposing the truth about a religion that not only wants to destroy Israel, but the USA and any who will not bend the knee to their false god. Welcome Back! We need to plan a trip out to compare notes!